Consumers are urged not to eat "grab and go" salads at Kroger, Giant Eagle, Ingles Markets and Marsh stores. Vaughan Foods of Moore, Oklahoma, is recalling romaine lettuce with "use by" dates of May 9 and May 10, the Food and Drug Administration said in a statement. The company sold the lettuce to restaurants and food-service facilities, the administration said. Vaughan said in a statement Tuesday that it had informed customers who purchased the suspect lettuce. "Food safety continues to be Vaughan Foods' number one priority," said Mark Vaughan, president and CEO of the company. "Vaughan management is not aware of any links to any food-borne illness associated with any product produced by Vaughan Foods." 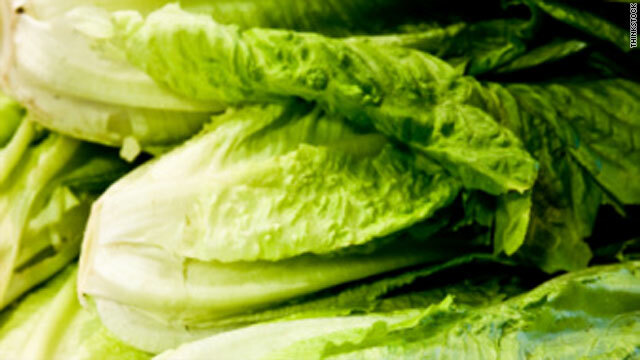 Vaughan's recall comes after Freshway Foods recalled romaine lettuce last week because of a possible connection to an outbreak of food-borne disease linked to E. coli O145 in Michigan, Ohio and New York. A sickened Ohio State University student sued Freshway on Tuesday. Freshman Richard Cardinale filed a lawsuit after his stool sample tested positive for E. coli O145, according to court documents. He suffered from gastrointestinal problems including bloody diarrhea and dehydration and was hospitalized on April 14 for treatment. "We have a new form of deadly E.coli to contend with," said food safety lawyer Bill Marler, who is representing Cardinale. "It is past time for the government and industry to track this bug as it does E.coli O 157:H7," he said, referring to the best known form of toxic E.coli. Authorities are investigating a farm near Yuma, Arizona, where the tainted lettuce was harvested, the Food and Drug Administration said. Vaughan Foods received lettuce from that farm, the administration said. Investigators have confirmed that the outbreak has sickened 19 people: 10 in Michigan, seven in Ohio and two in New York. Twelve of the 19 have been hospitalized, including three who developed a potentially life-threatening complication called hemolytic uremic syndrome, or HUS, the administration said. In addition, health investigators cite the outbreak as the "probable" reason that 10 other people have fallen ill: five in New York, three in Michigan and two in Ohio, according to the Centers for Disease Control and Prevention. Though most healthy adults recover from E. coli O145 within a week, young children and the elderly are most at risk of developing HUS. Federal health authorities are encouraging anyone with such symptoms to contact a health care provider immediately. Ohio-based Freshway Foods said that the recalled shredded romaine lettuce was sold to wholesalers, food service outlets, and some in-store salad bars and delis. The company said it sold the lettuce in question to businesses in Alabama, Connecticut, the District of Columbia, Florida, Georgia, Illinois, Indiana, Kansas, Kentucky, Maryland, Massachusetts, Michigan, Missouri, New Jersey, New York, North Carolina, Ohio, Pennsylvania, Rhode Island, South Carolina, Tennessee, Virginia, West Virginia and Wisconsin. Consumers are urged not to eat "grab and go" salads sold from in-store salad bars and delis at Kroger, Giant Eagle, and Marsh stores. The recall does not affect romaine lettuce and other types of lettuce and leafy greens from other producers. CNN's Val Willingham contributed to this report.